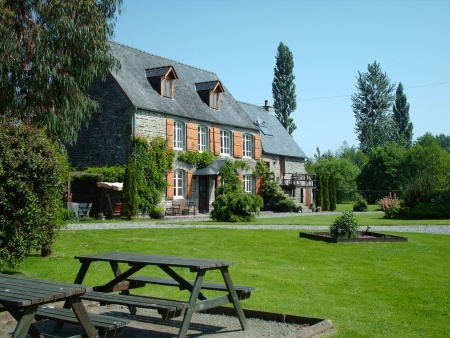 Three well appointed rental properties comprising 18th Century Farmhouse, Barn and Cottage on River Bank Cherence Le Roussel near Sourdeval, Normandy, France. Calm and Tranquility on the Banks of the "See"
This 18th century fully refurbished farmhouse, Barn and Cottage with swimming pool stands in extensive grounds on the banks of one of France’s premier salmon fishing rivers, "Le See". The self catering Farmhouse accommodation comprises lounge with wood-burner, satellite TV and video, full-size pool table, comfortable seating and views of the river. Six bedrooms sleeping between 4 and 12 people. Electric heating throughout. We also have a separate cottage to let sleeping two people, also The Barn sleeping six. Please use the links for “Farmhouse” “Little Cottage” and “The Barn” on the navigation bar to find out more information. The property is under two hours drive from the Caen, Cherbourg and St Malo ferries. The village centre of Cherence-le-Roussel is only a 5 minute drive away and has a bakery, small convenience shop and village bar. The town of Sourdeval can be found 10 minutes away by car and has a supermarket, various shops, restaurants and bars. Owners Sarah & Steve are on site to make your stay an enjoyable experience.